Paul Keating, architect of the Hawke government’s cross-media rules, has called on the Australian Competition and Consumer Commission to put the Nine-Fairfax merger under “high scrutiny”, and declared Nine has the “ethics of an alley cat”. In a scathing statement, Keating said the takeover was “an exceptionally bad development”. If Nine had a majority of the stock, as announced, it “will run the editorial policy,” he said. Keating said that for more than half a century, Nine had never done other than display “the opportunism and ethics of an alley cat. “There has been no commanding ethical or moral basis for the conduct of its news and information policy. Through various changes of ownership, no one has lanced the carbuncle at the centre of Nine’s approach to news management. And, as sure as night follows day, that pus will inevitably leak into Fairfax. “For the country, this is a great pity”. The government last year liberalised the media law, facilitating more concentration. Prime Minister Malcolm Turnbull welcomed the announcement and said the parties did not expect it to face any regulatory hurdles. “I think bringing them together will strengthen both of them,” he said. Television, online and print journalism was a “very tough, competitive environment nowadays”. “The arrival all of the online news services has made the media so much more competitive than it used to be, whether it’s the competition for newspapers or whether it’s the competition in the television area with streaming services like Netflix,” Turnbull said. “So I think bringing them together enables two strong Australian brands with great, very long traditions to be able to be more secure. So on that basis I welcome it”. Communications Minister Mitch Fifield said the government’s “historic media reforms” had “created an environment where Australian media organisations have a wider range of options as to how they combine in order to support their viability to ensure that they survive” in the age of the internet. But Keating said the media free-for-all the Turnbull government was permitting under its new law would “result in an effective and dramatic close down in diversity and with it, opinion’. “It is true that the technology has brought myriad voices to a public eager for diversity of information. 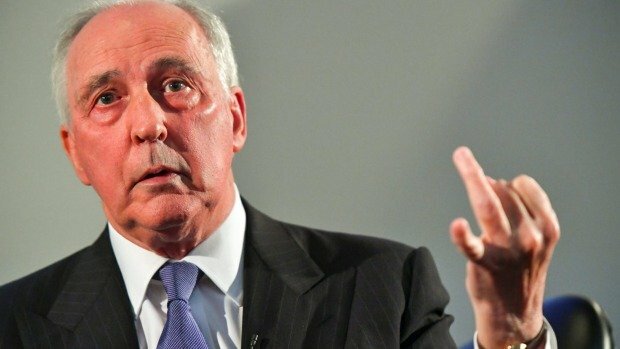 Keating said that notwithstanding the disruption caused by international platforms such as Google and Facebook “the answer for Australia is diversity of income streams for Australia’s majors and not a closedown in news and content with major print being taken over by major television”. Keating has had some major run ins with Fairfax over the years. But he had a different tone towards it on Thursday. “Fairfax spent decades missing all the signals about the rise of the digital economy when it could have put itself in a position of relative commercial independence. Keating said that if the government really had its way, Australia would face this much closed down landscape without the ABC being an independent national broadcaster. “On competition grounds and that of the imperative of local diversity, the Competition Commissioner should put this proposal under high scrutiny,” Keating said. He said that while the web brought increased diversity “the big wholesalers of news and information in Australia have always had the dominant impact. They have been the big dogs on the block. Today’s announcement means that in future, they will operate as a pack. “The cross-media rule at least split that dominance, giving the community various streams and alternatives within which to think. Today’s announced takeover of Fairfax by Channel Nine brings the big wholesalers back with a vengeance. And with it, were it to be permitted, a major shutting in of diversity”. It meant public broadcasters, the ABC and SBS, had never been more important, they said.